Angelo Paul Ramunni of North Canaan, Connecticut, author of his recently-published book “Accordion Stories from the Heart,” will present an author talk and mini-concert at the Middlebury Senior Center in the Shepardson Community Center at 1172 Whittemore Road in Middlebury on Friday, April 26, from 10:30 AM to 12:30 PM. The free event is open to the public. 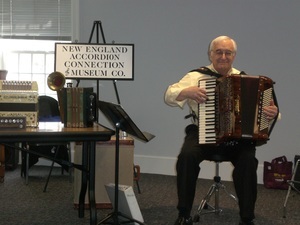 Founder of the New England Accordion Connection and Museum Co. in North Canaan, Conn., Mr. Ramunni will share stories from his new book. He will also perform a number of accordion songs, and answer questions from attendees. Books will be available for purchase along with the author’s autograph before and after the mini-concert. “Accordion Stories from the Heart” provides a wealth of stunning photos and loving insights into the exceptional, and sometimes tear-evoking stories involving many featured accordions from around the world. In his book, Mr. Ramunni tenderly describes the extraordinary people who played and listened to this beautiful musical instrument over the past two centuries. The 143-page hard-covered “Accordion Stories from the Heart” fills the reader’s heart with warm and fascinating accordion-related stories. The book features more than 70 photos of spectacularly decorated hand-built accordions of multiple colors and ivory-like keyboards. They originate from many countries around the world and date back as far as 1829. Mr. Ramunni’s privately-operated New England Accordion Connection & Museum Company showcases over 500+ stunningly beautiful accordions plus a studio where he repairs, buys and sells remarkable hand-crafted accordions. He also offers for sale over 10,000 pieces of sheet music and accordion-related books. “Accordion Stories from the Heart” is filled with very personal and easily-read, in large print, accordion stories. The book’s retail price is $39.95 and it is sold through https://www.amazon.com and at https://www.barnesandnoble.com. Autographed copies of “Accordion Stories from the Heart” can be purchased at the book signing and mini-concert or by calling the New England Accordion Connection & Museum Company at 860-833-1374. Up-to-date information on Mr. Ramunni’s frequently-expanding author talk and mini-concert schedule can also be obtained by searching @NEACMC on Facebook or by going to facebook.com/newenglandaccordionconnectionandmuseumco/. The Middlebury Senior Center at 1172 Whittemore Road in historic Middlebury can be contacted at 203-577-4166. For information, visit www.middlebury-ct.org.